From afar, I never quite understood the hoopla around the annual Sun Valley conference of corporate titans. But now, after three days in Idaho, I think I get it. Perhaps it's as simple as this: the media and technology moguls flock here for the same reasons that celebrities tend to date other equally high-ranking celebrities. They have friends in common, experiences in common and problems in common. And in Sun Valley, they can all catch up. "For me," Disney CEO Bob Iger said, "it's a chance to see everybody in one place." "Everybody" included, this year, Apple CEO Tim Cook, NFL commissioner Roger Goodell, Facebook CEO Mark Zuckerberg, GM CEO Mary Barra, Tesla founder Elon Musk, California governor Jerry Brown, Yahoo CEO Marissa Mayer, New York Times CEO Mark Thompson, and all three Murdochs who are now in charge of 21st Century Fox. For me, all the sightings were a reminder that the interests of these power players are stitched together like a multi-billion-dollar quilt. Iger, Comcast CEO Brian Roberts and Time Warner CEO Jeff Bewkes all dined at the same table on the first night of the conference. "Even though they're competing, they're really rowing, in the big picture, in the same direction," Brian Grazer, the acclaimed film and television producer, told me. 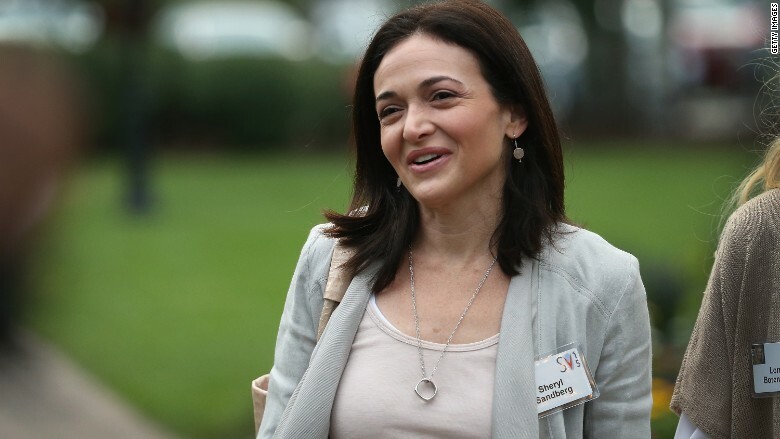 Sheryl Sandberg, chief operating officer of Facebook Inc., attends the Allen & Company Sun Valley Conference on Wednesday in Sun Valley, Idaho. All the CEOs "understand how hard the game really is," he said, and Sun Valley is a chance to commiserate or celebrate or decompress -- or all of the above. The attendees are invited by Allen & Company, an investment bank that helps orchestrate media mergers and acquisitions. Many guests bring their whole families, and there are constant activities for kids across the Sun Valley Lodge resort property, making it really feel like the "summer camp for billionaires" that it's sometimes called. The bank foots the considerable bill for the conference. And it treats the whole affair as a closely guarded secret: there is no public guest list or agenda. Attendees sometimes rebuffed our interview requests this week by saying that the conference organizers discourage interviews. Of course, that just adds to the curiosity and the mystique of the conference. Panel discussions about the business of fashion are a dime a dozen, but an off-the-record version with Diane von Furstenberg? Intriguing. 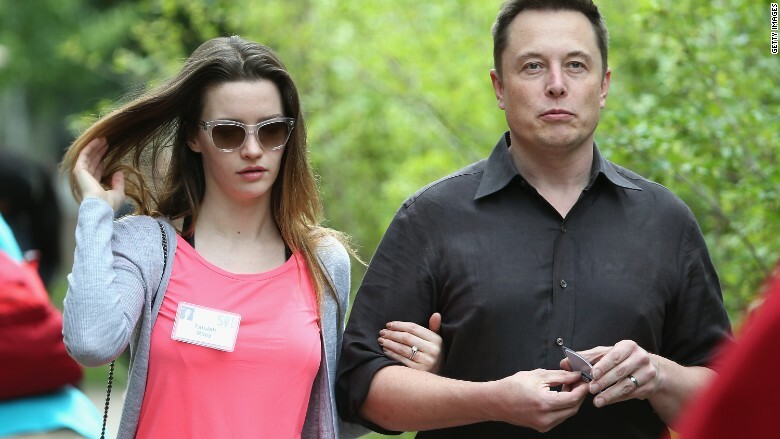 Musk was said to have dazzled attendees with predictions about the future during a Wednesday morning panel discussion. Sessions start early -- we spotted Rupert Murdoch, Facebook COO Sheryl Sandberg and IAC chairman Barry Diller walking inside well before 7 a.m. on Wednesday -- but they also end early, so power brokers can socialize during BBQ lunches, long walks and river-rafting excursions. 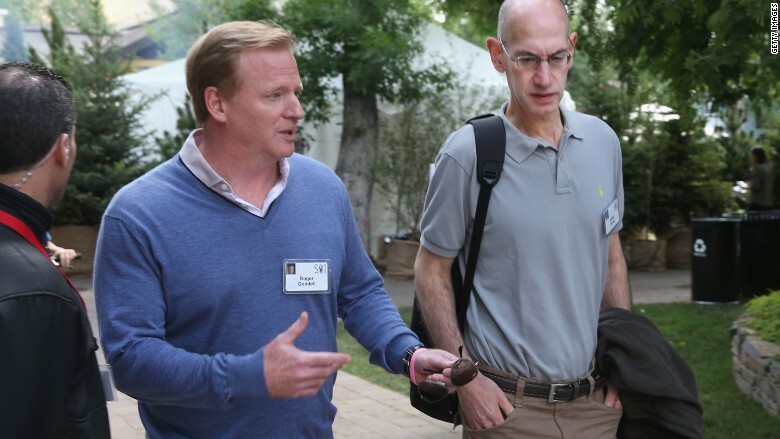 Roger Goodell (L), commissioner of the NFL, and Adam Silver, Commissioner of the NBA, attend the Allen & Company Sun Valley Conference on Thursday. The panels occasionally "expose me to something I haven't seen before," Iger said, "but it's mostly about the ability to convene and communicate directly with a lot of people." Indeed, deals are occasionally born here -- like Comcast's acquisition of NBCUniversal -- but my sense is that it's more about nurturing and bolstering relationships, something that's key at a time when there is palpable anxiety in the media industry about Internet disruptors. The only times we in the press pack see the moguls is when they're walking to and fro. Potted plants block off the lunch area, for example. New Jersey governor Chris Christie, now a presidential candidate, said he had no time for questions. When Cook appeared on Thursday, I wanted to ask about Apple's forthcoming News app and about the company's journalistic ambitions. All he'd say while walking by was that the app "is great" and that "I'm using it" in beta mode already. Earlier, Cook was seen walking with CBS Corporation CEO Les Moonves, with whom Apple has been negotiating a TV streaming deal. What they were talking about was anyone's guess. And Roberts, who abandoned his bid to buy Time Warner Cable in the spring, was seen chatting with Time Warner Cable CEO Rob Marcus, whose company is now being acquired by Charter Communications instead. There was considerable talk about Snapchat and its CEO Evan Spiegel, who was at the conference this week, apparently for the first time. But for every Silicon Valley star there were many veterans, like Warren Buffett and former New York City mayor Michael Bloomberg. When Home Depot co-founder Ken Langone -- a Christie supporter who presumably had a chance to catch up with his favored candidate -- entertained a few questions, he called the conference "a wonderful place to just have informal talk with a lot of people across a lot of different industries." "It's very rare," he said. "There's nothing like it. This is it."